HASLETT, MI, February 4, 2019: I recently attended a Tourism planning event and learned that Americans love to take vacations and they say vacations are important to them – and yet more than 54% of all North American employees with vacation time leave a considerable amount of their vacation time unused! As a matter of fact, up to 25% of the employees interviewed, reported that they did not take even half of their allowed time off. These unused vacation days carry a significant economic impact and since individuals don’t recreate enough, it impacts on their productivity, creativity, and can damage an employee’s personal well-being and relationships with family and friends. Knowing all of the above, why not use some of your vacation time to take a snowmobiling vacation? We have great snow conditions in many locations so it’s a great time to plan a short trip. Throughout the winter, I often snowmobile on the weekends – Friday, Saturday, and Sunday are when most people are out riding. Once in a while I am able to take somebody snowmobiling on a Tuesday, Wednesday, or Thursday – mid-week – and what an enjoyable time it is! The trails and riding areas are much less crowded and I can easily get a seat at my favorite restaurant for breakfast in the morning. In our culture, we have hyper connectivity which sociologists call ‘work martyrdom.’ Individuals who take their vacation time off, have greater happiness at work and at home. Individuals who take their time off to go snowmobiling have even more fun and help support a great outdoor recreation activity that supports rural America. The key to taking vacation time, according to the experts, is to plan for it. Studies show that 75% of the people who plan a vacation actually take it. The most effective remedy for us who want to use our vacation days is to plan for them. People who plan their vacation tend to take longer vacations and enjoy themselves more while people who do not plan for vacations take significantly fewer days – from 0 days to 3 days at the maximum. There are some great trails and riding areas out there, and it makes sense to me to bring some family and friends along to build memories. At the Tourism seminar I learned that most bosses support individuals who take their vacations. The boss knows when you take a vacation you come back happier and you are more efficient while you are working. For the rest of this snowmobiling season and for next season, it’s important that we all try to change our habits and take a few additional days off for snowmobiling. You can start by reviewing your calendar and put down some definite dates to take that snowmobile vacation. Holidays are a great time of year for snowmobiling and it should be relatively easy to take an extra day before or after the holiday to take a longer snowmobiling vacation. 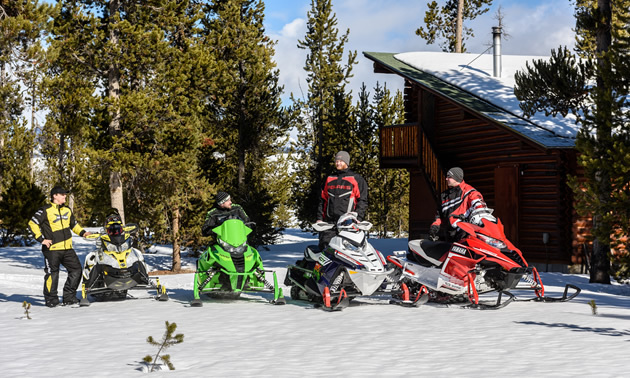 It is never too early to start planning your next snowmobile vacation. Block some days on your calendar and plan to go snowmobiling. As many of us know, there is not snow everywhere, but certainly snow can be readily available after a short drive.